Continuing on with our series of Hackaday original videos, this week we are presenting a video all about DC motors. DC motors are relatively simple electromechanical devices that turn electrical energy into rotational movement. 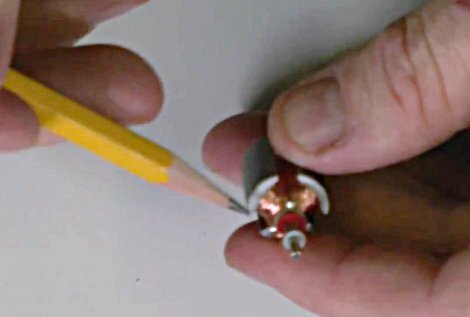 In this video, [Jack] takes apart a small DC motor and shows off all of the parts inside and describes how it all works. He also talks about how to modify DC motors to increase their speed or torque as well as how to change their directional preference. In this video, he rewinds a motor and shows how this changes the performance characteristics of the motor. Is mechanical stuff not your thing? Stay tuned for next week when we launch into a series of videos where we show how to program for the Atmel ATmega328 processor using C. In this series, we’ll show you the real nuts and bolts of programming for this processor by working with its I/O pins,timers, A/D, interrupts, and more. Sometimes we need more psy ops in our life. Being an eminent fan of the Discworld series, Reddit user [rdmiller3] decided he needed to build Lord Vetinari’s clock. This fictional clock was placed in the waiting room for Lord Vetinari in several of the Discworld books. Although the clock keeps accurate time overall, it sometimes tics irregularly and out of sync. The reason? To whittle away the minds of whoever waits for Lord Vetinari. The build uses a standard battery-powered analog clockwork. The ticking mechanism is just a magnet mounted inside a coil driven iron core. The coil leads were disconnected from the clock circuit and connected to digital inputs of an Arduino. With a few random() calls, the clock keeps accurate but random time. Unfortunately, the clock stopped working after a few weeks because the 5 V from the Arduino was, “pounding it way too hard.” [rdmiller3] says a few resistors and LEDs for the voltage drop would make for a more reliable circuit, though. Check out the hard to watch video of the clock in action after the break. 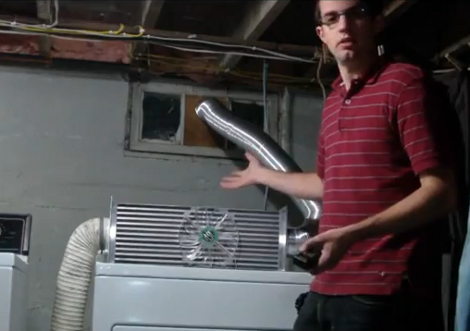 Here we see [Christopher Suprock] hanging out in his basement laundry area in order to show off his intelligent heat exchanger. The reason for the device is simple, when you use your clothes dryer , hot water heater, other other utilities that generate heat, energy is often wasted in the form of hot exhaust gases. Why not get the most for you clothes drying dollar by sourcing that hot air to warm your house. The block you see on top of the dryer is a heat exchanger. The exhaust from the dryer passes through a radiator assembly before being vented outside the house. Some control hardware monitors the temperature of the input side and switches on the fan when it detects a higher temperature than the ambient air. Air then flows through the radiator, picking up heat energy from the exhaust gas. See [Christopher’s] explaination, and some thermal readings while the dryer is running, in the video after the break. This makes us wonder, if the heat exchanger drops the exhaust gas fifty degrees before being vented, will this cause any issues with condensation? [Autuin] wrote in to share a few things he’s put together using spare vacuum tubes he had sitting around. With no other practical use for the tubes in mind, he fiddled around and came up with a couple of items that could be neat to have around the house, depending on your style of decor. The first item is a vacuum tube night light. While the tubes were not originally built with the express purpose of putting out light in mind, they do happen to throw out a nice warm glow when plugged into a suitable power supply. [Autuin] mounted one in a wall wart, driving it at double the rated voltage, which provides a decent amount of light. His second creation is similar to the first, but meant for your tabletop rather than your wall. 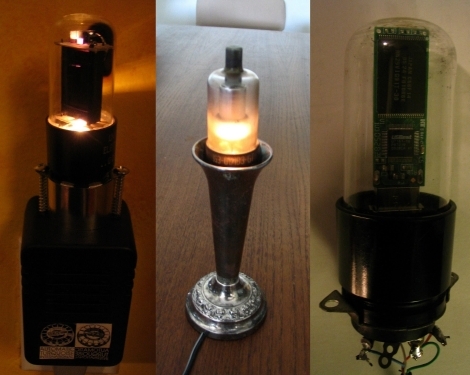 He stuffed a vacuum tube into a candle holder, added a power source, and called it a day. The vacuum tube candle actually looks pretty nice, and with a bit of tweaking could easily be made to behave like a candle as well. The final item he shows off is a vacuum tube flash drive. Little more than a carefully hollowed out tube with flash drive guts inside, it is more suited as a permanent fixture than as a portable storage device. Even so, we think it looks pretty cool. Have you done anything neat with old vacuum tubes? Let us know in the comments! [Nav] wanted to change his keyboard mapping for one particular keyboard, rather than on each operating system. 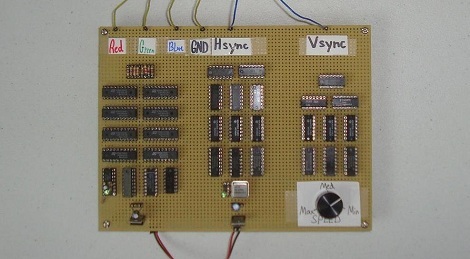 He used an AT90USBKey as a replacement PCB by soldering to all of the contacts on the key matrix. This allows him to remap the keys by following onscreen prompts. As with the AVR-based arcade controller, this project uses the LUFA package to handle the USB stack. Instructables user [XenonJohn] recently put together a fantastic tutorial detailing how he made an RFID-controlled jukebox. The Magic Music Table was created for a disabled child, who is unable to use a CD payer, nor navigate small buttons and menus on MP3 players. He originally though about making the buttons more accessible a la the Frankenkindle, but ultimately settled on making the table instead. Embedded in the center of the Music Table under a piece of plexiglass is a small project box containing an iPod, Arduino Mega, and a Parallax RFID reader. He crafted small RFID “bricks” that can be waved over the RFID reader, triggering the iPod to play a specific album from a large playlist. The Arduino acts as the middleman, controlling the RFID reader and relaying the appropriate information to the iPod when required. The system looks pretty sturdy, and [XenonJohn] says that it works great. We think it’s a wonderful use of technology – you certainly can’t argue with brightening up a child’s day. Continue reading to see a video of the Magic Music Table in action.